Diarrhea is a condition in which bowel movements are abnormally frequent and stools are abnormally liquidy. It is not itself a disease but is usually a symptom of some other underlying disorder. Diarrhea may be a result of food poisoning, diseases such as dysentery or cholera, emotional upsets, or many other conditions. Diarrhea is very common, a condition with which almost everyone is familiar. Usually, it is little more than an unpleasant nuisance that briefly interferes with work or play. Sometimes, however, severe attacks can seriously endanger a person's health by causing dehydration * . Diarrhea can last different lengths of time: it may be either acute (coming and going quickly) or chronic (long-lasting). Diarrhea develops in the small or large intestines. The intestines may become irritated and inflamed by an infection or by certain foods. The inflamed intestine does not reabsorb as much water from the stool (bowel contents) as it normally would. In some infections, the intestines actually add more water to the stool. This extra water makes the stools very loose. Although diarrhea may occur by itself, often it is accompanied by abdominal pain, gurgling bowel sounds, nausea, vomiting, and general weakness. The stools, or bowel movements, are loose or watery and may contain blood, pus, mucus, or droplets of fat. Sometimes attacks of diarrhea alternate with periods of constipation. Bouts of diarrhea that range from mild to severe can be caused by several types of infectious microorganisms * (my-kro-OR-gan-iz-ims) in contaminated food or water. Diarrhea can also result from the body having trouble digesting dairy products or other foods. Mild cases of diarrhea can be caused by eating spicy food or by anxiety about something stressful, like having to give a speech in front of a lot of people. We all have heard of a party at which a lot of people got sick after eating the same food. Foods that are not cooked thoroughly or kept refrigerated until just before serving can cause food poisoning. Also, it is important to make sure that raw meat or poultry does not come in contact with cooked foods, that the hands are washed thoroughly before handling any foods, and that all dishes and utensils are thoroughly washed after they have been in contact with raw meat or poultry. * microorganisms are living organisms that can only be seen using a microscope. Examples of microorganisms are bacteria and viruses. Bacteria such as staphylococcus (staf-i-lo-KOK-us) can cause digestive upsets of this kind. Certain strains of a common intestinal bacterium known as E coli (EE KO-ly) can cause very serious illness with symptoms that include diarrhea. A group of bacteria called salmonella (sal-mo-NEL-la) also are often responsible for food poisoning. Salmonella causes gastroenteritis (gas-tro-en-ter-I-tis), or inflammation of the gastrointestinal tract. Salmonella infection can cause diarrhea for a week or longer. Dysentery is an intestinal infection that causes severe diarrhea, often with blood, pus, and mucus in the stools. It is especially common in developing (poor) countries with poor sanitation facilities, causing the food and water supply to become contaminated. The most common causes of dysentery are bacteria and amebas * . Amebic dysentery can cause chronic diarrhea that comes and goes. Outbreaks of cholera often accompany natural disasters such as earthquakes and great storms that disrupt sanitation and cause food and water to become contaminated. It also is widespread in refugee camps and other wartime situations in which people live in severely overcrowded conditions. Food and water contaminated by the cholera bacteria cause a watery form of diarrhea that can rapidly lead to death from severe dehydration. A mainly tropical disease that can give rise to severe diarrhea is giardiasis (jee-ar-DY-a-sis). Caused by a parasite * , it usually enters the body in contaminated drinking water. In recent years, giardiasis has become increasingly prevalent in developed countries such as the United States, especially among preschool children. In settings such as households and day-care centers, where children are in close contact, giardiasis can be caught by touching stool-contaminated objects or from hand-to-hand contact. * amebas (a-MEE-buz) are small, one-celled animals that live in fresh and salt water. Amebas can be seen only with a microscope. * parasites are creatures that live in and feed on the bodies of other organisms. The animal or plant harboring the parasite is called its host. Two parasitic infections, cyclosporiasis and cryptosporidiosis (discussed elsewhere), are major causes of diarrhea worldwide. 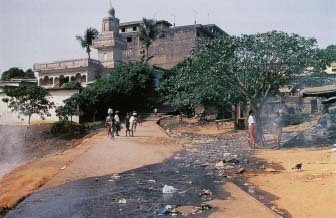 An open sewer overflows a walkway in Abidjan, Ivory Coast, in West Africa. Unsanitary conditions like these often result in widespread dysentery and cholera outbreaks. digestive upsets that include diarrhea; these are sometimes called traveler's diarrhea. Often, the exact cause of traveler's diarrhea cannot be determined. Likely suspects are certain viruses and strains of bacteria such as E coli that are present in the local water supply. Other causes may include changes in diet, excessive alcohol intake, and salmonella or shigella bacteria. Sometimes people get diarrhea from eating dairy products like milk, cheese, and ice cream. This is because there is a sugar in milk and milk products called lactose (LAK-tos). To be able to digest this sugar, there must be an enzyme * in the body called lactase (LAK-tays). Some people do not make enough of this enzyme, and when they eat milk or milk products they get diarrhea. Many diseases can interfere with the intestine's ability to absorb or take up digested foods. This is called malabsorption (mal-ab-SORP-shun). When foods are not digested and absorbed properly, it can cause diarrhea. Antibiotics kill not only the bacteria that make us sick, but also kill the "good" bacteria that normally live in the intestines and help us digest food. This can allow the overgrowth of certain bacteria that cause diarrhea. What If Diarrhea Lasts a Long Time? Diarrhea caused by parasites, such as in amebic dysentery and giardiasis, can become chronic (long-lasting). Infestation with worms also can produce lasting diarrhea. More often, the cause of chronic diarrhea is not an infection. Instead, it may be the result of inflammatory bowel disease, which includes ulcerative colitis (ko-LY-tis) and Crohn's disease. A disorder known as diverticulitis (di-ver-tik-yoo-LY-tis), in which abnormal pouches in the walls of the intestines become inflamed, can also cause chronic diarrhea. Other causes include cancer of the intestine, a condition called irritable bowel syndrome, and inability to digest certain foods. Infants and young children commonly get diarrhea from viral infection or giardiasis. When a baby has diarrhea, usually the condition is more serious than in adults or older children. An infant with these symptoms can lose body fluids so rapidly that his life can be endangered, especially if he also is vomiting. Signs of dehydration in infants, such as a dry mouth, lack of urine production, or unresponsiveness, require immediate medical attention. Bacterial intestinal infections such as cholera cause many infant fatalities in developing countries. Most cases of diarrhea are mild and do not require medical attention. For bouts that last more than a few days, recur, or show blood in the stool, a doctor should be consulted. For infants, medical advice should be sought if the diarrhea lasts more than 48 hours. Medical tests that may be used in diagnosis may include examination and culture of stool samples (for bacteria, viruses, or parasites), x-rays, or use of a colonoscope (ko-LON-o-skope), an instrument for viewing the lining of the colon. Treatment of mild diarrhea consists mainly of drinking liquids to prevent dehydration. In some cases, doctors may prescribe medications that ease symptoms. Treatment of severe diarrhea depends largely upon the cause. For example, antibiotics may be prescribed for dysentery or certain kinds of food poisoning. Washing one's hands thoroughly after using the toilet is always important, but especially so where contagious forms of diarrhea such as giardiasis can be spread. Travelers in foreign countries should use bottled (not tap) water, and avoid eating raw fruits and vegetables. More people died from unsanitary conditions during the U.S. Civil War than from bullets. Of the estimated 600,000 fatalities during the war, the majority were due to epidemics of diarrhea-inducing diseases such as dysentery and typhoid fever. These diseases were caused by contaminated food and water in the encampments. A voluntary organization called the U.S. Sanitary Commission was founded to combat the conditions and provide medical assistance, and they held "sanitary fairs" to raise money. Rosenthal, M. Sara. The Gastrointestinal Sourcebook. Los Angeles: Lowell House, 1997. This book is easy to read and tells how to take care of the digestive system and its upsets. Janowitz, Henry D. Your Gut Feelings. New York: Oxford University Press, 1994. This is a well-written, illustrated book that includes a chapter on diarrhea. Peikin, Steven. Gastrointestinal Health. New York: HarperCollins, 1991.